Sort of. Yeah, well. I don’t have an excuse for having been away for so long. Except that I’ve been in a funk. A stinky, gray, ugly funk. I’m trying to force myself out of it, but it hasn’t been easy. I miss blogging. I miss being excited about my knitting. This weekend I asked my daughter to help me organize and put away all of my yarns. And we did it! It had gotten overwhelming in my den, with all of my new yarns from the last 6 months or so all over the place, and not put away in containers. This weekend we rectified that situation. My husband went out and got me two new bins, and we reorganized and re-categorized everything. I even found some stuff to give away, but I’m going to give the ladies in my knitting club a first whack at it. There’s not much in the discard bin, but it’s a start. I figure by now that at least some of the yarn that’s been in my stash since I first started knitting deserved some serious thought. If I haven’t touched it in 5 years, am I going to? Doubt it. So what have I been knitting? For starters, this little cutie. It’s the Little Bubbles Baby Set, by Nina Isaacson, of Knit Picks. I really like that this little sweater is so adorable and is keeping my interest by teaching me several new techniques. 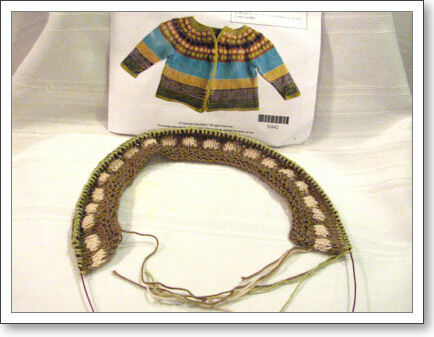 One of the things that was new to me was the “Little Bubbles” stitch that makes the cute design on the yoke of the sweater. I was a little confused by the instructions, but thank goodness for Ravelry, because the designer was just a quick message away. Not only did she explain to me the proper technique for doing the stitch (versus the way I had interpreted it in my mind), but she pointed me to a YouTube video that demonstrated the technique. After watching the video and receiving Nina’s explanation, it all made perfect sense and off I went! I have actually completed more of the yoke than this picture shows, but hopefully I’ll have an updated photo soon. I do find the cotton yarn to be a little fiddly to work with, so I’m saving this for an at home project, while my February Lady Sweater is still coming with me on my daily commute and to knit group and such. Sounds backwards, huh, having the big project along for the ride, and the teeny baby one for at home? Yeah, maybe, but I find it harder to work smaller stitches on smaller needles. Maybe that’s why I have yet to fall in love with socks. But alas… about a year ago I started a pink scarf for my good friend Jennifer, whose favorite color is pink, and I never finished it. Jen used to live in my same town near me and our “birthday buddy” daughters went to the same school. But she lives in Michigan now, and I wanted to finish the scarf in time for her visit last year. Sadly, here it is, more than a year later, and she’s about to come for another visit. This time, I MUST finish the scarf and give it to her while she’s here. So, I’ll be taking a short break from BOTH sweaters for some marathon scarf knitting. Speaking of which, I’d better get busy. Sorry I was away so long. I’ll try not to let it happen again. I’m still looking for my lost mojo, but hopefully I’ll find it soon. In the meantime, I hope you’ll hang in there with me. I’d love to hear from you all! Last weekend was the first weekend in May. If you’re a fiber fanatic, and anywhere within driving distance of the state of Maryland, you know what that means. 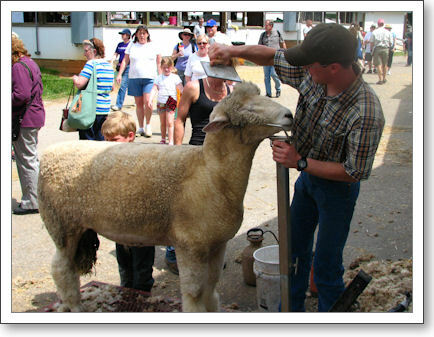 It was the Maryland Sheep and Wool Festival. Which, for fiber lovers like me, is almost as good as Christmas. So, last Saturday I left the house at about 10 a.m. with my good friend Steve. This trip has become something of an annual event for us. Steve is my best friend from college; we were next-door neighbors at the campus apartment complex and met during a fire drill some 24 years ago. It was a good day. The weather was unseasonably hot, but we considered that a good thing, since the year before I had shorted the electronics of my wheelchair during the previous year’s trip. So, while the heat was a big topic among festival goers, the whole time I kept telling myself that rain would have been much, much worse. The fairgrounds are about 40 minutes or so from my house, but this year, at about three miles out, we were stopped dead in our tracks. The traffic was truly horrible. But, I was with a good friend and we had Glee going on the iPod, so again, it could have been much worse. Still, it was two and a half hours before we found ourselves walking into the festival gate. I had been e-mailing my friend Jen all the way, as I knew she had been planning to arrive at the festival much earlier than I was. 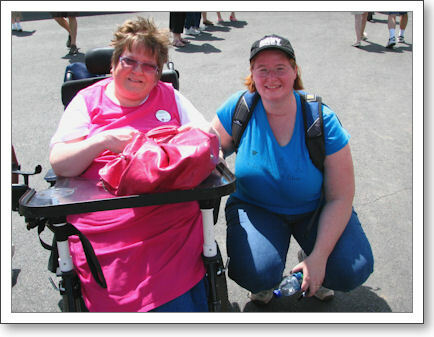 She reported that she was making a trip to her car just as we were getting onto the grounds, and so we happened to bump into her near the gate. At the same spot I ran into my friend Karen from work. all before we ever made it inside the grounds! Since we’d been so long in the car, Steve and I arrived at the festival feeling ready for lunch, so we set off looking for food right away. We found a lamb vendor and someone selling lime fizzes right next to each other. The lines were long, so Steve got in one and I got in the other. 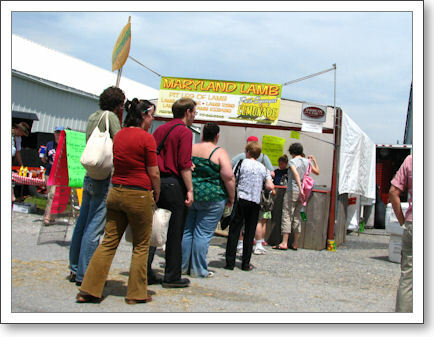 The lamb vendor was one I don’t remember seeing before. I ended up with a beautiful kabob for lunch, and washed it down with a lime fizz, both of which I consider to be a true festival tradition. Lots of people tell me that they can’t bring themselves to eat lamb at the sheep and wool festival, with all the adorable lambs so close by. I don’t mind eating meat, so long as I don’t have to talk to it first, and the lamb is something that just makes the whole experience unique. I love the aroma of lamb as it is cooking. 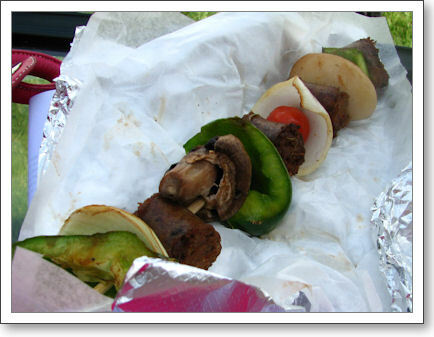 My kabob was like a whole meal on a stick, including lamb sausage, peppers, onion, tomatoes, mushrooms, and a baby potato. 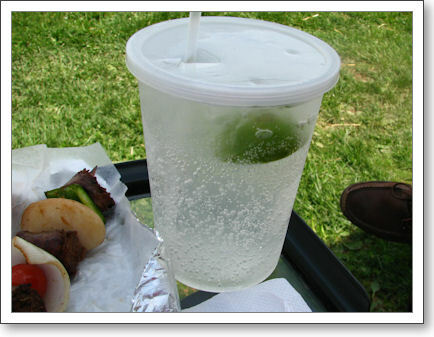 And the lime fizz was the perfect cooler for such a hot day. Turns out that this device has a foot pedal like that which you’d find on a sewing machine, but you can set it to tap once for on, and tap again for off. So, the kind people at the booth set up one of the machines so that it could be within my reach, and off I went! This is the HansenCrafts miniSpinner, equipped with a Woolee Winder. I fear that I am going to have to get one of these things. I can do it! My first few tries yielded a couple inches of slubby, twisty yarn, but hey, since I’ve never really spun before I still need to get a feel for drafting and holding the yarn. Oh, no! I’m starting to use spinners’ words! I definitely don’t need another thing to be obsessed about, but I feel the bug biting. I figure if stuff a 20 in my sock drawer once a week, it won’t be that long til I’ve saved up, right? Of course, there are animals everywhere. And there are lovely examples of what one can make with their wools. Of course, I did some shopping while at the festival. More about what I bought will be coming in a future post. But what matters to me most, I think, about this festival is the atmosphere. 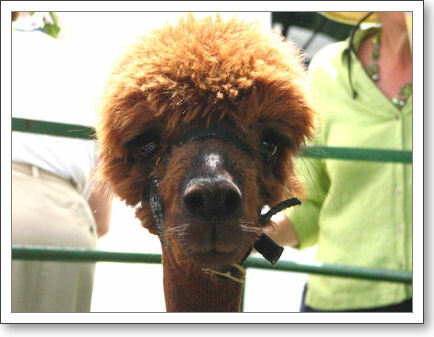 I know there are other fiber festivals around the country. I’ve never been to any of them, but I feel like I’ve got the best there is, right in my own backyard. 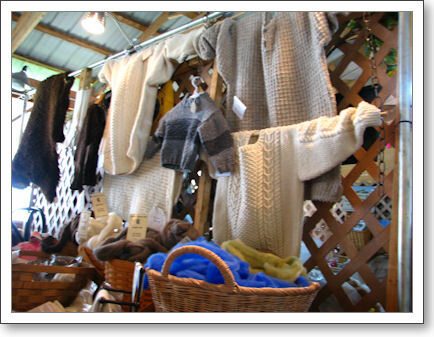 It’s great for people who want to shop, a wonderful place to see and learn about fiber-producing animals, and a wonderful tradition that I look forward to every year. 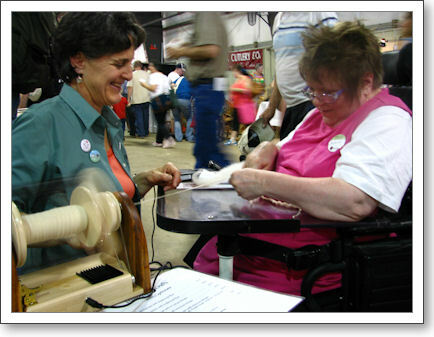 It’s a great gathering place for fiber friends, and I look forward to seeing people that I know there, year after year. I’m already looking forward to next year. There’s so much to do there, I keep telling myself, that I don’t really need to buy yarn. Yeah, right. Stay tuned for that part of the story. Wow… today is the last day of Blog Week! I am sad to see it end, but, at the same time, I confess that I am a bit relieved as well. I never have been a daily blogger, and I have no intention of maintaining this week’s hectic pace. In fact, most of the time I don’t have nearly enough to say, so it has been very helpful to have pre-defined topics. If Blog week ever happens again, so long as it’s not next week? I’m definitely in. I think today’s topic, “A Good Yarn,” which is kinda sorta supposed to be about a favorite yarn, is one of the hardest so far to write. How do I choose a favorite? Isn’t that like trying to choose a favorite child, or a favorite flavor of ice cream? The truth is, I never met a yarn I didn’t like. I love them all, for different reasons. I have knit with everything from the cheapest dishcloth cotton to the yummiest of cashmere. 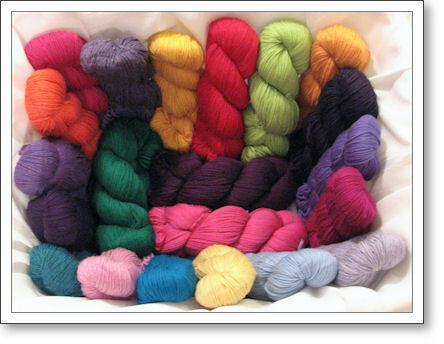 I admit that I have not tried quiviut yarn yet, because at roughly $90 an ounce, I can’t afford to fall in love with it! 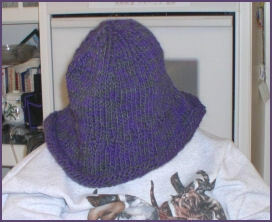 I even must confess that–don’t tell anyone, please–I don’t hate acrylic yarn. In fact, before I became a knitter, I don’t think it occurred to me that I would ever want to knit with anything other than acrylic, mostly because of the ease of care. But, I have changed my ways. I have so many types of yarn in my stash now, that acrylic is probably the least among them. So, when I looked around to determine a favorite yarn, if I could possibly have such a thing, it was a good, basic wool. There are other yarns that also are good, sturdy wools I love. Most notably, Knit Picks Wool of the Andes, which is a fabulous wool at a fabulous price, and Brown Sheep Lambs Pride, which contains a little bit of mohair. 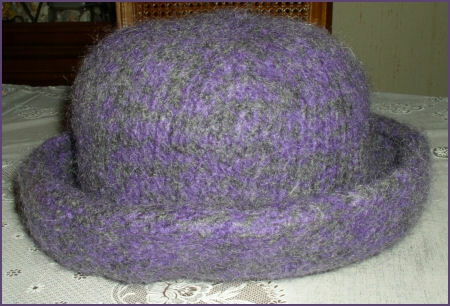 This is my favorite yarn for making my felted hats, as the mohair gives a slight fuzzy halo to the hats. 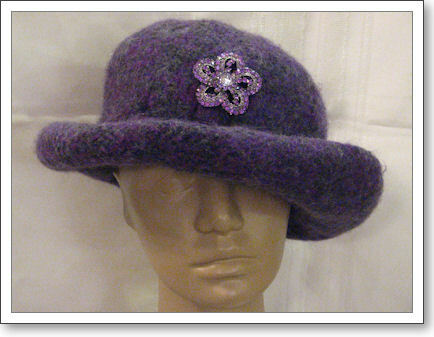 I think the mohair adds to the elegance of the felted items. 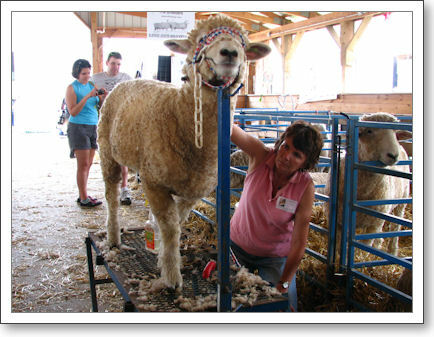 This weekend was the Maryland Sheep and Wool Festival, which is my favorite event of the year. The weather was about as hot as I ever remember for this early in May, but I was really thankful that it wasn’t raining. I saw lots of friends, enjoyed great food, heard some fabulous traditional music, and oh, yes, some yarn followed me home. I’m still working on my photos from the event but I hope you’ll be hearing more about that in the next day or so. Until then, I bid you goodnight.